Our Spitfire aluminium front doors create a state of the art entrance to any property. View our range of modern aluminium doors and get a free quote today! Our range of Spitfire residential doors perfectly blend all important attributes – security, safety, aesthetics and thermal performance. There are no downsides. The technically advanced design of our aluminium doors means they are a popular choice – not just in the UK, but throughout Europe. Your installation will provide you with the quality, strength and compelling visuals you’re looking for. Aluminium front doors installed by Fox Windows & Doors in Kenilworth, Leamington Spa, Warwickshire and surrounding areas can be calibrated to suit your design requirements. Hundreds of style combinations are possible and you’ll be able to choose different sizes and configurations. Our S-200 range excels across all essential criteria. If you want aluminium entrance doors that are safe, secure and thermally efficient, this is the right product for you. Don’t forget, a wide range of combinations will be available to help you refine your design. If you think you understand big, then think bigger. Our Spitfire residential doors can be built to a scale previously unseen. They can span widths up to 1.2 metres and can be as high as 3 metres. Create a front door that stands out from all the rest. Start your journey today by contacting our experienced and friendly team. Tailor the appearance of your aluminium front doors by selecting from a rich portfolio of hundreds of colours. Create a finish of your choice - metallic and gloss are just two of the options available - and complete your design with your preferred texture. Build a Spitfire door that responds to your design requirements in every way by choosing Fox Windows & Doors. Access a stunning range of Spitfire residential aluminium doors. Create an entrance that will take your visitors’ breath away. Fox Windows & Doors will be able to help you refine your design by selecting the best style, colour, hardware and accessory options - resulting in a product and entrance that you’re delighted with. If you are looking for aluminium doors that will minimise heat loss within your home, every variation in our Spitfire range is built to leave cold air outside where it belongs. Spitfire front doors deliver U-values as low as 1.4 - which improves on the performance of even the best composite doors available. Save money when you choose from this range. The S-200 Spitfire is deceptively stunning. It’s all too easy to marvel at its aesthetics, without appreciating the hidden technology that’s driving it. Your aluminium door will include three layers of security glass and carefully-engineered parts that prevent it from yielding to extreme weather. Your new doors will continue to add value to your home for years. Are You Ready to Go Biometric? It’s not science fiction, it’s reality. Our S-500 aluminum doors use a biometric key entry system. Although a market-leading multipoint locking system comes with your purchase as standard, you can also choose to go high tech by asking us to install an automated security system that uses a keypad or finger scanning device. Keeping your home warm and lowering heat costs is one of your main priorities when looking for a new aluminium door. The S-500 exceeds Passivhaus requirements to deliver a U-value of 0.5. This is made possible through the use of dedicated seals, infills and three layers of glass. Your installation will keep your home comfortable and your bills lower. 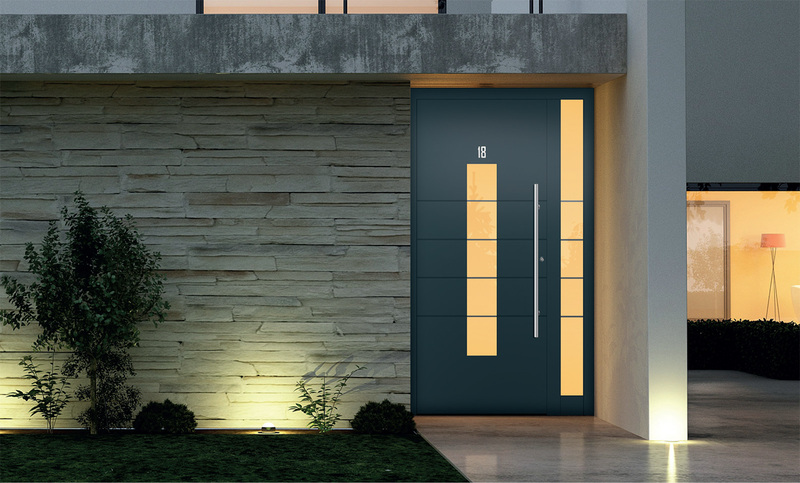 Like the S-200, its close cousin, the S-500 is an aluminium door that can be refined to suit your tastes, Select your preferred glass, hardware and accessories – then add that all-important finishing touch by selecting your colour scheme and texture. Fox Windows will help you with every aspect of this process to guarantee a design that’s perfect. The S-500 uses the Schuco profile. Your installation will be of the highest quality and fitted by our team of experts who understand the Spitfire range of aluminium doors completely. Our team is ready to talk to you about the extensive customisation options available with this truly unique range of front doors. Choose market-leading aluminium doors for your home and enjoy outstanding performance and aesthetics. Contact us today for your front door prices. Our Spitfire aluminium doors are available in Kenilworth, Leamington Spa, Warwickshire and surrounding areas. You can enhance your home with a range of large, modern, and technically advanced front doors. Call or email us to ask a question about our Spitfire range and find out our aluminium entrance door and installation costs today!